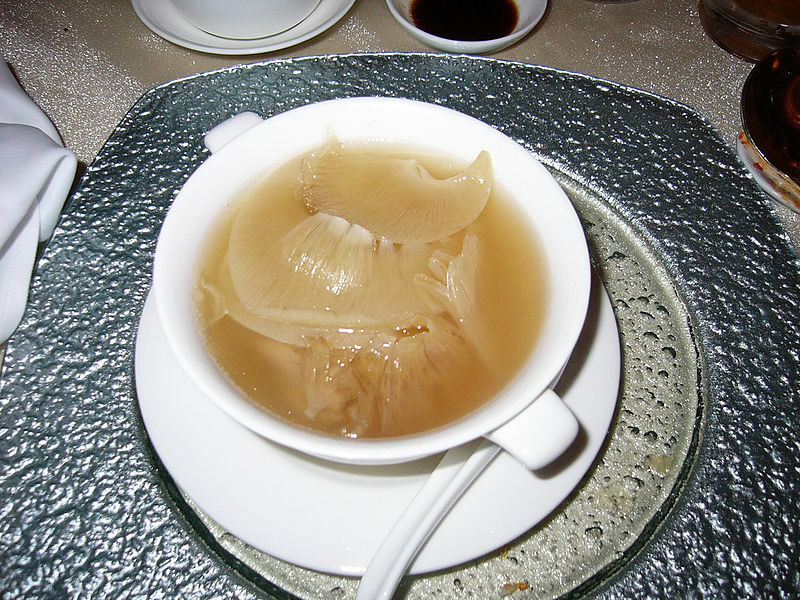 Shark fin soup is a traditional Chinese delicacy made from cartilage elements found in the fins of sharks called “ceratotrichia”. The ceratotrichia are made into a noodle-like substance, which has no taste, no smell, and no nutritional value, only texture. 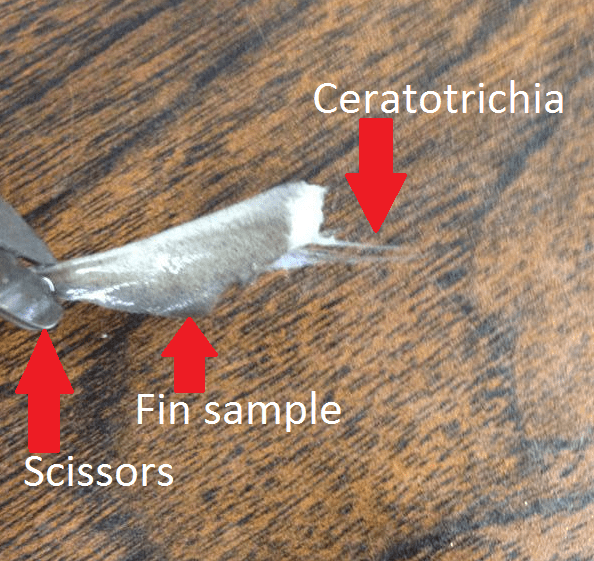 A small fin sample (~ 1 centimeter) from our lab, showing the ceratotrichia fin rays. Photo by me. Growing demand for shark fin soup as a result of China’s economic boom is one of the main drivers of the global overfishing of sharks. Is it sometimes, but not always, associated with the wasteful and inhumane fishing practice known as “shark finning.” Sometimes the soup is made with the fins of Threatened or Endangered species of sharks that aren’t supposed to be caught. As the shark fin trade is global, and large parts of it are unsustainable and poorly regulated, it is an area of concern for ocean conservation advocates. How economically valuable is the global shark fin trade? The total value of global shark fisheries, which includes but is not limited to the fin trade, is more than $600 million annually, which is more than twice as much as the U.S. lobster fishery is worth. The market price of shark fins varies pretty widely. WildAid reports that dried fins can sell for “up to $700 per kilogram,” while SharkSavers reports that they can sell for “over $400 per kilogram”. This Smithsonian article says that they can sell for up to $1,100 a kilogram. However shark fin traders have reported a precipitous drop in prices in the past few years, and particularly large fins from particularly rare species can sell for more. This TRAFFIC report notes (page 4) that a single fin from a whale shark sold for $57,000, a higher price than you’d expect from the weight alone. It’s worth noting that even the low-end estimate of $400 per kilogram is higher than the $382 per kilogram that a large bluefin tuna sold for in Japan this year, and that’s usually touted as an example of how crazy the high prices of rare seafood have gotten. How much shark fin soup can you get from a shark fin? It doesn’t not take an entire shark fin to make a single bowl of shark fin soup. A small piece of the dried, processed ceratotrichia is used. It’s surprisingly difficult to find an English-language recipe for shark fin soup using Google, which I suppose is a good thing in terms of shark conservation. According to this Food.com recipe, though, making a single serving of shark fin soup requires three quarters of an ounce of dried shark fin. 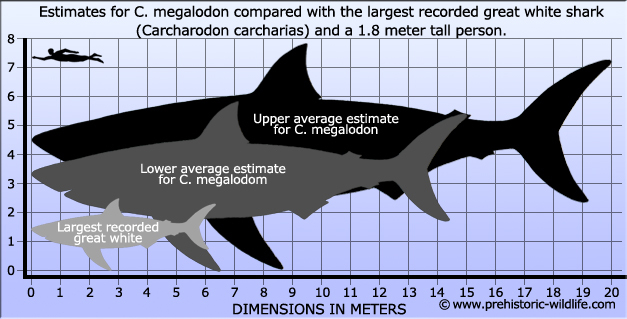 How big were adult megalodons? No one has ever seen an entire megalodon, so we don’t know for sure, but this article summarizes some of the different ways scientists have estimated their size from their teeth. It concludes that a conservative estimate for the size of an adult megalodon was likely about 50 feet long. A megalodon that size would probably weigh about 50 metric tons. For reference, the megalodons in the “Mega Shark vs.” series are much larger than this, and the largest recorded whale shark was approximately 40 feet long. Image from Prehistoric-Wildlife.com . I used their lower average estimate. How large a shark’s fins are compared to the rest of the body varies by species, age, and body condition. Some shark fisheries use regulations that estimate what percentage of a shark’s body weight is made up of fins, regulations called fin to carcass ratios. A recent global review of these policies found that the average fin to carcass ratio was 3 percent. How much could you sell an adult megalodon’s fins for, and how much shark fin soup could you make with them? It should be noted that fin to carcass ratios are not a great way to manage a shark fishery, but we can use the global average fin to carcass ratio to estimate how large a megalodon’s fins would be. If a typical adult megalodon would weigh 50 metric tons, and on average 3% of a shark’s mass is fins, then we can estimate that a typical adult megalodon would have approximately 1.5 metric tons of fins. The market prices for fins listed above are for dried fins, but since there is limited information on how much weight is lost during drying, I’ll assume for the purpose of this and future calculations that the total weight of a megalodon’s fins does not change during drying. Let’s ignore recent market trends and the extra added value of rare, large fins, and just the low-end estimate of $400 per kilogram. If a typical adult megalodon has 1.5 metric tons (1,500 kilograms) of fins, and fins sell for $400 a kilogram, then the fins of an adult megalodon could be sold for a total of $600,000. 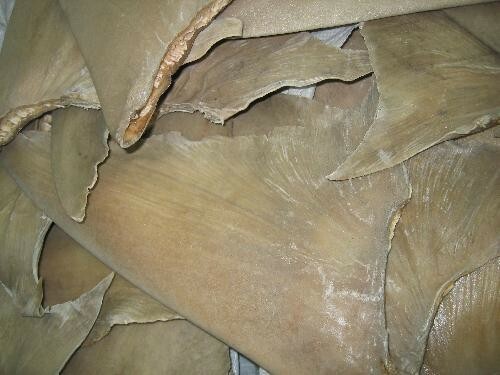 If it takes three quarters of an ounce of dried shark fin to make one bowl of shark fin soup, then with 1.5 metric tons (52,910 ounces) of shark fins, you could make 70,456 bowls of shark fin soup. Sharks are ecologically important animals, and the largest shark that ever lived would likely have a unique ecological role. Sharks in general don’t reproduce until late in life and have relatively few young, which makes them extremely susceptible to overfishing. We don’t know much about megalodon reproduction or life history (though we know they used nursery areas similar to modern sharks), but it’s reasonable to assume that they’d suffer from similar constraints. If the fins of a single individual were worth $600,000, then it would be hard for commercial shark fishermen to resist going after and killing every last megalodon. And if the hypothetical overfishing of a species that has been extinct for millions of years has you as upset as it has me, you should learn more about the real overfishing of shark species that are still around… at least for now.